The first batch of mall-grown veggies went on sale last week. Shopping malls, those bastions of American consumerism, have not been immune to the recent economic downturn. In a recent piece by our own Greg Lindsay, we looked at the impending decline of the mall, which is part of the “single-use environment” category of real estate development that will slowly disappear over the next thirty years, according to one developer. But what will replace these environments, and more importantly, what will happen to the massive malls of today? One possible solution can be seen in Cleveland’s Galleria mall. The mall lost many of its retail shops over the past few years, leaving gaping holes in the greenhouse-like space. So employees of the Galleria came up with the idea for the Gardens Under Glass project, a so-called urban ecovillage inside the mall that features carts of fruits and vegetables grown on-site. The project was recently given a $30,000 start-up grant from Cleveland’s Civic Innovation Lab. 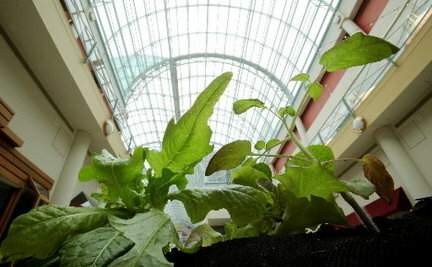 Poole and Hamilton put in the first green stuff this week–a 12-foot cart of lettuce and other greens near the Galleria’s first-floor escalators. Their aim is to start an education center and store in a former candy shop, invite sustainable-product makers to display and sell their items, and sell produce to restaurants and individuals. They dream of hosting school groups and teams of volunteer urban gardeners eager to work beds of herbs and greens and vine systems raised hydroponically, aquaponically and in organic soils. We can see it now: the malls of today turned into the suburban (and urban) farming powerhouses of tomorrow. And while we’re at it, why not turn entire economically depressed cities into agricultural centers as well? It’s already happening in Detroit, where entrepreneurs are turning vacant lots into factory-side farms. And if Cleveland’s mall farm works out, maybe New Jersey can become the next big agricultural innovator–the state has the most malls per square mile in the country.